Panettone is traditionally eaten during the Christmas and New Year holiday period in Italy. Christmas is close. The best eat before date is 20th February so you will have plenty of time to eat it if you are lucky enough to buy one in Melbourne. It is made with the best ingredients, and it is organic. Zeally Bay were experimenting with making Panettone last year but they were not happy enough with the mixture in time for Christmas 2017. But this year – perfect. Thank you Zealy Bay, I shall enjoy mine. The above quote is from Zeally Bay’s website. Good luck to those of you who live in Victoria, and enjoy it if you are able to purchase one. Panettone’s popularity round the world keeps on growing and I have seen various packages of imported Italian Panettone in select shops. 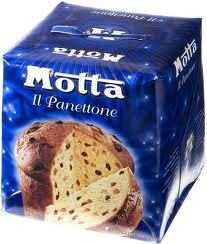 Panettone is traditionally eaten during the Christmas and New Year holiday period in Italy. Christmas is close. Panettone was made famous and affordable when it was commercially produced (from the 1920’s) and railed all over Italy and now in many parts of the world. The cheaper versions of light textured Panettoni (plural of Panettone) that you may be familiar are made with commercial yeast. The artisan and much more expensive varieties of Panettone are made with natural yeasts using the same traditional principles as making bread by the sourdough method. When I first started playing around making bread at home I used commercial yeast (called lievito di birra in Italian) and my father used to remind me of how his mother made bread – she always saved a bit of uncooked dough from the loaf she was shaping, keep it in a jar with a lid and use it in the next batch of dough. He said that she never used commercial yeast. He was Sicilian and full of stories. He used to tell me about companion plantings and the effects of lunar cycles on plant germination, growth, and development. But thinking myself a modern woman, most of the time I doubted the folk lore. It was only years later that I learned about natural leavening and how my grandmother was using lievito madre, ‘mother’ or a ‘starter’ in her baking – this is the wild yeast mixture that develops bacterial and lactic ferments that promote natural leavening. It is what imparts the bubbles in the texture of the dough and contributes to the characteristic aroma and flavour found in sour dough bread. I like artisan breads – handmade and hand-shaped sourdough breads made with quality ingredients and integrity in bakeries like Zeally Bay Bakery. It is based in Torquay, but there are stockists in Melbourne and in some parts of regional Victoria. The above quote is from Zeally Bay’s website. John and Jan Farnan began making quality sourdough breads on a small scale in 2007. John, his son and a team of dedicated bakers have continued to develop an entire range of baked goods using Australian, certified, biodynamic and organic ingredients and applying traditional methods for making sourdough. The long fermentation process used in sourdough breads has many health benefits. Of interest is that the bakery is using the natural leaven culture that was began in 1981. The reason that I mention Zealy Bay is that I have been privileged over time to try a whole range of their breads including their brioche and Easter buns and recently the Panettone that the bakery has been perfecting in time for Christmas… and it is great. It was fragrant and had complex flavours, a result of using high-quality, natural ingredients and a long fermentation process. I could taste the natural flavours of the yeast, flour, eggs, butter and the fruit. Panettone made with sourdough if wrapped well, will remain fresh for days and just like in good bread, the flavours will mature and develop. Being certified organic is a guarantee that the ingredients do not contain GMO’s, chemical pesticides or result in land degradation. So, if you plan to have Panettone for Christmas it is worth considering if you will buy a local or imported one or make one at home? The more affordable and commercially produced Panettone made by large production companies is bound to have preservatives and artificial flavours. If it is imported, you will have no way of knowing when it was baked and how it was transported. 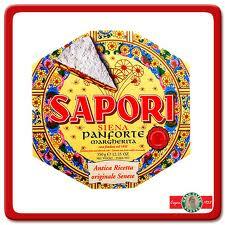 The more expensive range of imported Panettoni are very likely to taste better than the cheaper versions. They are also more likely to have been made using the sourdough method – the older and more traditional method of making Panettone. Panettone is no longer just made in Milan. There are regional varieties made by artisans using local variations – for example some may have saffron, chestnuts, chocolate, figs rather than sultanas. The Sicilian versions are likely to contain higher amounts of citrus fruit, (this is grown extensively in Sicily). The artisan Panettoni may have been baked not as long ago as the more commercial ones and their expense may also reflect the cost of having been transported in faster and better climate-controlled conditions. Few Italians bake Panettone at home and this is not surprising. Making Panettone at home requires patience and is a laborious process. It requires quite long leavening times over several days and three consecutive stages of mixing and kneading. You need good quality, gluten-rich flour to “support” such a rich dough. The ‘mother’ or ‘starter’ has to be made well ahead of time and has to be mature, in strength, with the right degree of acidity. The bacteria contained in it must be nourished for fermentation, so every 3-4 days it is necessary to “refresh” the mother’s yeast and add some flour and water. Ideally while it cools, the Panettone should be hung upside down to stretch and form a dome. Knitting needles are inserted all the way through the bottom half of the panettone between two objects of equal height or over a large saucepan and left to stretch at least six hours. Do you really wish to do this? 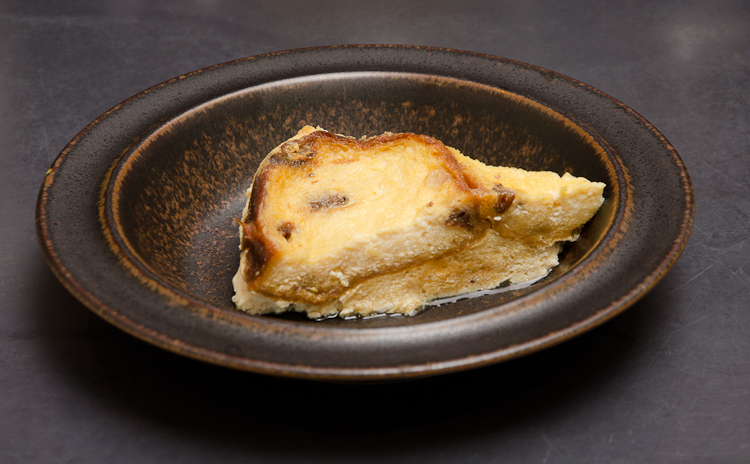 My partner loves bread and butter pudding. Most of the time he makes it with a good quality fruit loaf – sourdough with plenty of fruit. I found two small ponettoni (plural) in my cupboard (90g each). These are uneaten presents from Christmas and need to be used up and were used for this pudding. The characteristic smell of panettone brings back many memories for me – as a child I used to dunk it into hot chocolate. 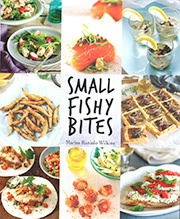 It is a simple recipe and pretty standard in the UK and Australia. Sometimes he makes it with bread and he also adds a little vanilla and some good home made jam between the layers of bread. Grease a casserole dish with a little butter. Layer the slices of pannettonein the casserole dish. Mix together the eggs, milk and sugar with a fork – use a jug. 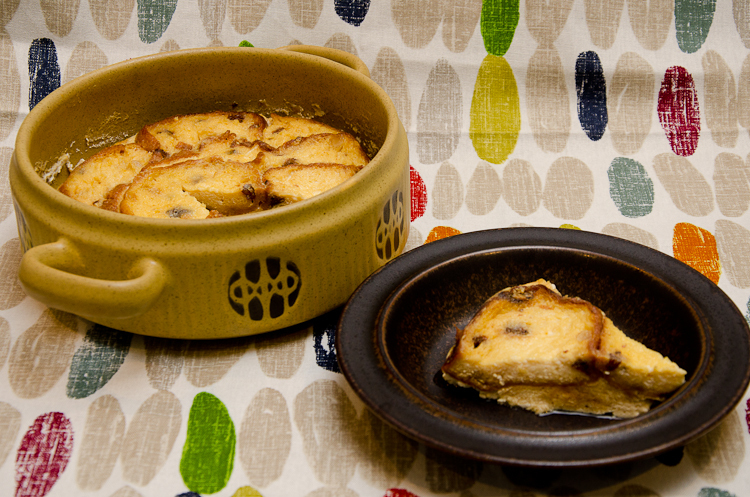 Pour the liquid mixture evenly over the layers of panettone. Bake for 30- 35 minutes until set. I inherited a recipe book called Millericette from my mother (A thousand recipes Aldo Garzanti editore, published 1965). I found a recipe for budino di pane – literally translated aspudding of bread. Use 400g soft bread crumbs; soak in 1 litre of milk. After a couple of hours rub through a sieve, add 250g of sugar, 6 beaten eggs, 500g of sultanas and raisins, 1 cup full of orange peel chopped finely and 1 glass of rum. Mix well. Transfer contents to a well buttered mold or one lined with buttered paper. Bake in a moderate oven for 30 mins. Use orange jam (sweet orange marmalade), press the jam through a sieve, add a couple of spoon fulls of boiled water and sugar, add gin or Grand Marnier and mix well. Italians do like their alcohol in sweets!! Please do not copy material from this site without requesting permission. To do so is not only a breach of copyright – it is also bad manners. 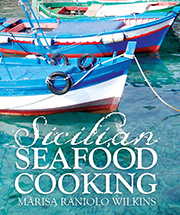 When the respected writer Mary Taylor Simeti (a famous food writer and expert on Sicilian Food),. She is an historian and a an expatriate American, married to a Sicilian organic wine maker and farmer) visited Melbourne recently, she and I and pastry cook Marianna De Bartoli, who owns Dolcetti, a pasticceria in North Melbourne, were all asked this same question during an interview for Italianicious Magazine (Nov-Dec issue 2010). In Ragusa, where my father’s family comes they tend to eat the same foods as they do at Easter: scacce and large ravioli stuffed with ricotta dressed with a strong ragu (meat sauce) made with tomato conserva (tomato paste) and pork meat. These are followed by some small sweets like cotognata (quince paste), nucateli and giuggiulena (sesame seed torrone). In other parts of the island gallina ripiena (stuffed chicken cooked in broth) is popular, while others may eat a baked pasta dish, for example: anelletti al forno. timballo di maccheroni or lasagne made with a very rich, strong meat ragu. This may be followed by capretto (kid) either roasted or braised. There may be cassata or cannoli for dessert or the wreath shaped buccellato made with dried figs, almonds, walnuts, sultanas and spices (from Latin buccellatum meaning ring or wreath). It is said that the early version of pane ttone (bread big) was not the light textured, yeast perfumed, fruit bread we are familiar with, before it was made common by industrial production. It was a type of heavy, enriched, Milanese fruit bread baked at home and not just eaten at Christmas time. Panettone was made famous and affordable when it was commercially produced (from the 1920’s) and railed all over Italy. As a child growing up in Trieste the most famous panettone was the Motta brand (and still a well known brand in Italy) and part of the charm was opening the box and releasing the fragrance. In spite of writing recipes, I am not one for following recipes closely. I always improvise and adapt amounts of ingredients to suit my taste. For example I double the amount of pepper, nutmeg and coriander. On occasions I have also included walnuts and pine nuts which were included in panpepato, a predesessor. Use a 9 inch spring form pan; line the bottom and sides with baking paper Heat the sugar, honey, and butter in a large heavy saucepan over low heat, stirring constantly, until the syrup registers 242 to 248 on a candy thermometer (a little of the mixture will form a ball when dropped into cold water). Immediately pour the syrup into the nut mixture and stir quickly until thoroughly blended. Pour immediately into the prepared pan and smooth the top with a spatula. The batter will become stiff and sticky very quickly so you must work fast.